Known computer hacking and vigilante justice group, Anonymous, has struck again. This time it is pulling directly at our horsepower sensitive strings. With the upcoming Formula 1 race in Bahrain, an area that is currently in civil unrest due to the actions of its government, Anonymous has decided to nail F1 where it hurts, Interwebz traffic. Last year F1 was forced to cancel its Bahrain races, due to similar unrest, but this year the race was and still is scheduled to go off without a hitch. This latest attack is an attempt by anonymous to force F1 to cancel the race out of protest, and it just might give the racing group the excuse it needs to pull out. Anonymous is also calling for all viewers and spectators of F1 to ignore all television broadcasts of the race, as well as not buying tickets to the event. The vigilante hackers also are attempting to coax the drivers to not leave the starting line when the green flag drops. 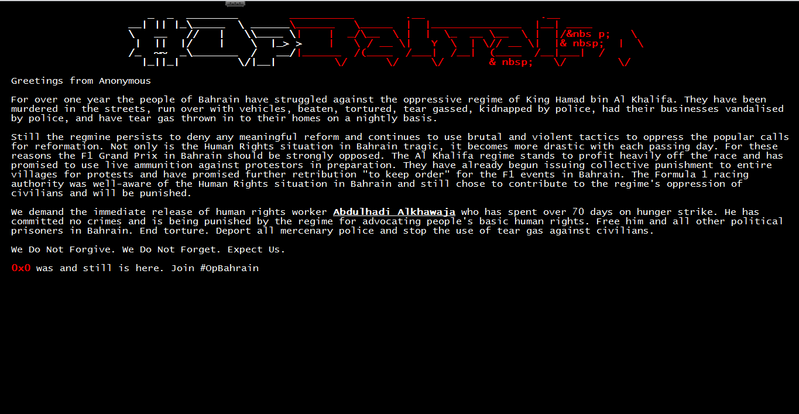 Anonymous also took down F1 fan site, F1-Races.net, and leaving just a message on its landing page regarding the Bahrain situation. As we typed this up, the Formula1.com came back live, so it appears that the Anonymous attempt to keep the site down through the race was unsuccessful, and there is no announcement about the attack or cancellation of the race. We will keep you updated as more news, if any, comes about.